The 19th century saw the rise of the professional and clerical classes in England, and with this came the establishment of new working patterns. Many workers now lived in the suburbs of major cities, with the new railways making daily long-distance commutes feasible for the first time. Indeed, some railways offered a special low-price ticket for early morning commuters, and many workers had arrived in the city by 6am. 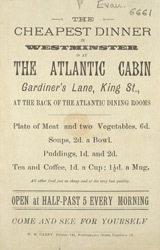 Cafes such as the Atlantic Cabin opened for breakfast at this time, and served a lunch of pie or stew around midday. They stayed open late so that commuters could eat before travelling home.